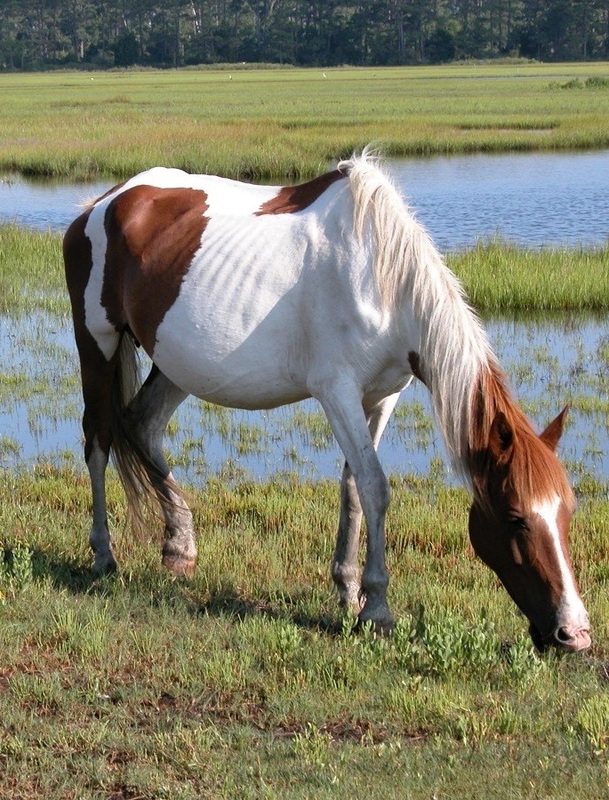 The Chincoteague Pony is a breed of ponies originating from the Assateague Island off the coast of Virginia and Maryland. Stories were told that they we left by settlers in the 17th century to avoid fencing laws and taxation of livestock. However, there is strong evidence that they are descendants of the 17 surviving Arabian horses of a Spanish galleon called the La Galga which wrecked off the coast of Chincoteague Inlet in the 1700s. The legacy left by La Galga was the inspiration for Robert Louis Stevenson to write Treasure Island and another children’s classic, Misty of Chincoteague written by Marguerite Henry in 1946 and made into a movie in 1961. Within the pages of Marguerite Henry’s book is an account of the shipwreck legend told by the real life character of Clarence “Grandpa” Beebe who owned the real life Chincoteague Pony, Misty. Misty lived out her life on the Beebe ranch on the island of Assateague where she had a total of three foals, Phantom Wings (1960), Wisp O’Misty (1961), and Stormy (1962). Misty died in her sleep on October 16, 1972. As of 2015, there are only around 200 descendants of Misty. 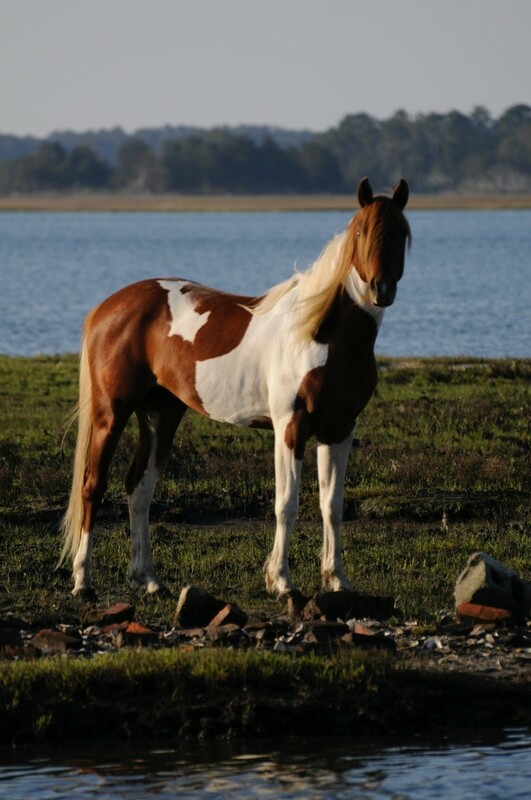 Chincoteague Ponies are horse like in appearance, averaging 13.2 hands and weighing around 850 lbs. 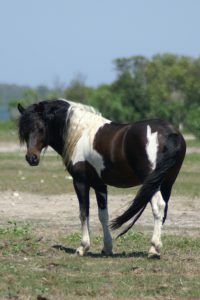 They can be any solid color, and are often found in spotted pinto patterns, which are a favorite with breed enthusiasts. In general, the breed tends to have a straight to slightly concave facial profile with a broad forehead and refined neck. The chest is broad with a shorter back and broad loins. 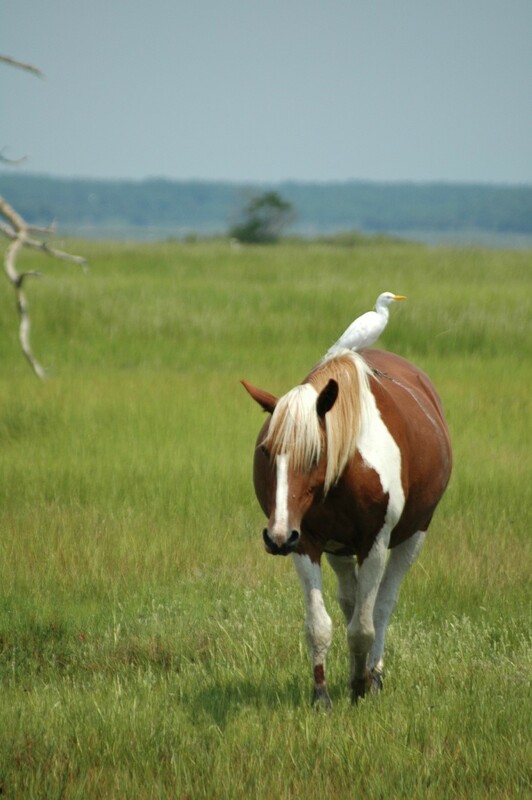 Once trained, Chincoteague Ponies excel as hunters, jumpers, drivers, and trail ponies. They are healthy and are generally easy keepers. Their temperament is typically very easy going, with a willingness to please and a great aptitude for learning. In 1835, Pony Penning began as settlers rounded up the ponies and removed select individuals to the mainland. The first official “Pony Penning Day” was held in 1924 by the Chincoteague Volunteer Fire Company as a way to raise money for fire equipment. Ponies were rounded up on the island by the “Salt Water Cowboys” and then they swam across the channel to the mainland where they were separated and any older foal was marked for auction. The ones that were not marked for auction were then made the return swim back across the channel. This same practice continues today always on the last Wednesday and Thursday of July. In 1985, the National Chincoteague Pony Association was founded to register all horses that were auctioned during Pony Penning Day. 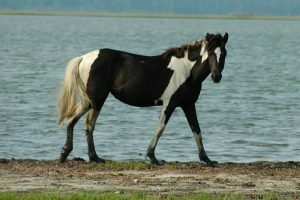 A second registry, the Chincoteague Pony Association, was created in 1994 to maintain a breed registry and stud book of all Chincoteague Ponies, including those bred on the mainland. Currently, there are only 150 Chincoteague ponies living on the Chincoteague and Assateague Islands. Our Foundation Chincoteague Pony bloodlines came from the late Stanley White, Sr. , world class respected judge, trainer, breeder and owner of Grandeur Arabians in Ocala, Florida. Stanley has bred hundreds of National Champion, Reserve and Top Ten Arabians and Half-Arabians. He was twice APAHA Horseman of the Year and was inducted into the Region 12 Hall of Fame in 2013 and 2015, and The Arabian Horse Association Judges Hall of Fame in 2015. Together with his wife, Kitty they received the APAHA Lifetime Achievement Award in 2011. 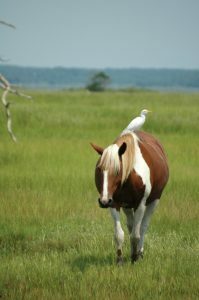 Chincoteague Ponies figured prominently in the life of Stanley White, Sr. who perhaps was one of the most highly-esteemed horseman in history. My husband and I had the honor of meeting Stanley and Kitty at their Grandeur estate while we were in Citra, Florida in 2014. Kitty invited us in and we visited with Stanley for a couple of hours recording some of his memories. Stanley was born in 1936 and grew up in Waverly, VA and was a family friend of William Peebles. 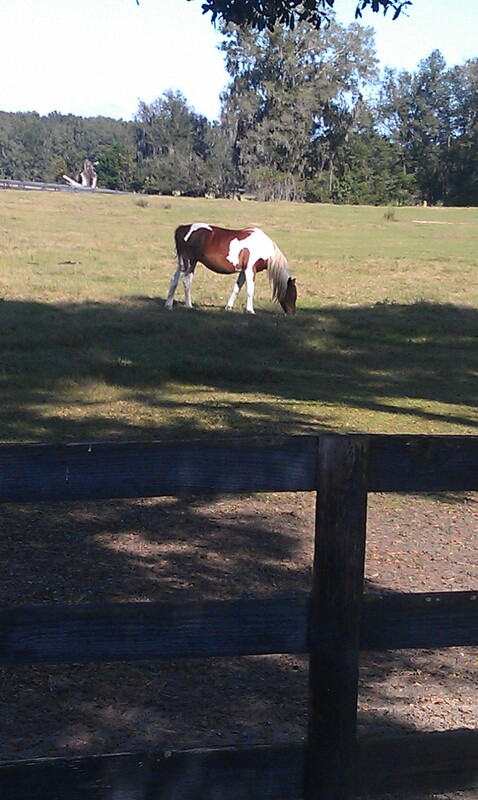 He told us Mr. Peebles bought him his first pony, a black Chincoteague mare he named Doll Baby. He was ten years old and rode his pony everywhere, even to school. He also attended the annual Chincoteague Pony roundups every year. Stanley personally knew “Grandpa” Clarence Beebe the breeder of the famous Chincoteague pony, Misty. Around 1960, Mr. Peebles introduced Stanley to Bazy Tankersley. He trained with the legendary Bazy Tankersley, breeder and founder of Al-Marah Arabians. His first National Champion was Count Bazy in 1967. 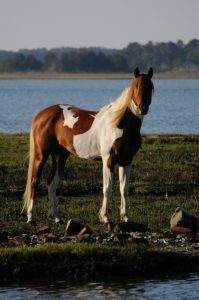 Stan told us it was Mrs. T who donated Al-Marah Sunny Jim to the Chincoteague Island for improving the wild herd ponies. Stanley then moved in 1968 and he worked at Don Ford’s Lancer Arabians where he trained and showed *Asadd, among other Arabian horses. 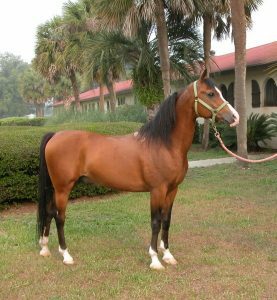 Following the dispersal sale of the prized Lancer herd in Ocala, Florida in 1980, Stanley and Kitty founded their own facility, Stanley G. White’s Grandeur Arabians. Stanley returned to Chincoteague in 1987 with his wife and family for the roundup and in years after rode numerous times in the annual Chincoteague roundup to the extent of being awarded the title of honorary Saltwater Cowboy. Every year in July the Chincoteague ponies swim from their grazing refuge on Assateague Island to the sale pens on Chincoteague Island. 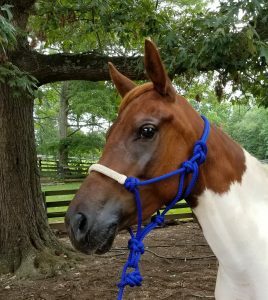 Most of the foals are then auctioned off and the proceeds benefit the Chincoteague Volunteer Fire Department who own the pony herd. One fireman, David Savage and another breeder of Chincoteagues, Donald Leonard contacted Stanley and asked for help in improving the pony bloodstock. It was Stanley’s love of Chincoteagues that drew him to immerse himself in the breeding and improvement of the wild herd of ponies and to contribute his Arabian stallions to improve the ponies health and quality. In 1987, Stanley hand picked the mares to breed with his Arabian stallions. 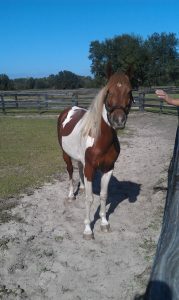 He knew which mares were sired by Al-Marah Sunny Jim, hand picked them and brought the mares to Grandeur for breeding. It was from those mares that Tanglewood bloodlines began. 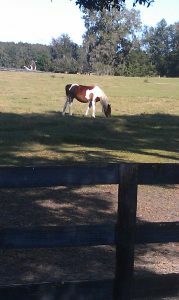 While at Grandeur, we were introduced to Thunder, the SIRE of our current Chincoteague ponies. He is pictured above at Grandeur and on Assateague Island. Click on his Certificate of Registration to view a larger size. While at Grandeur, we were also introduced to Thunder’s DAM, Mint Julep. Her photo is to the left. 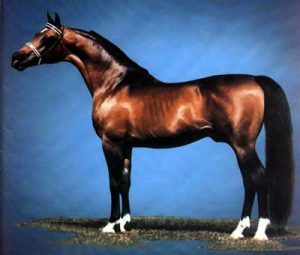 Mint Julep was born March 13, 2001 and is out of Champion Arabian Stallion Calistoe who is out of Champion Cerdom by Wisdom out of all time leading Arabian Sire of Champions *Bask. To the right is a picture of Thunder’s Sire Grandeur Arabian Stallion, Calistoe. Calistoe was a winning English Pleasure Champion out of Cerdom by Wisdom (*Bask) X FF Chalonne by EW Fez (*Bask). 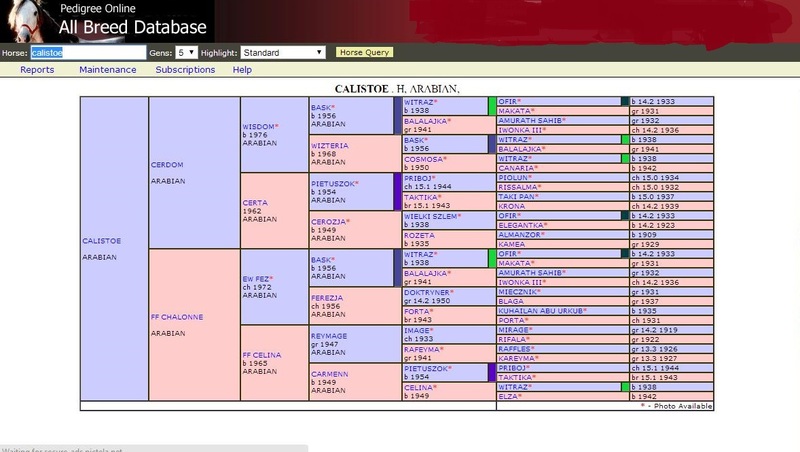 Calistoe’s bloodlines include Arabian Cerdom by Wisdom and includes *Bask whose success resulted in him becoming one of the most prolific Arabian Sires worldwide. Click on his Pedigree to view a larger size. Here is the immortal Arabian stallion, *Bask. From Poland, *Bask began his prominent breeding career in the United States in the 1960’s. His impact on the American Arabian horse breeding has been called “colossal”. He is a leading Sire of many National Champions both in Halter and Performance. He is one of the most prolific Arabian Sires worldwide. Here is a copy of the Chincoteague Pony Association Certificate of Registration for Pebbles. 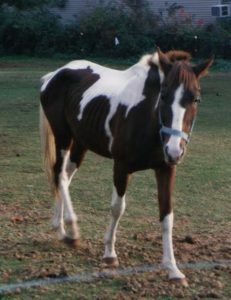 Pebbles was purchased by the Whites at the Chincoteague Pony Penning Auction in 1994 and is the DAM of our Tanglewood’s Misty. 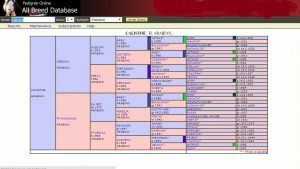 Pebble’s Sire is Hurricane and Dam is Witchkraft. Click on the Certificate for a larger view. WitchKraft also called Friendly Girl, the DAM of Pebbles. 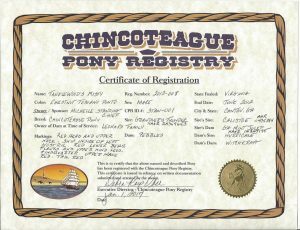 Here is the Chincoteague Pony Registry Certificate of Registration for our 2012 Mare, Tanglewood’s Misty. Misty is currently available for purchase. Click on the Certificate for a larger view. Here is the Chincoteague Pony Registry Certificate of Registration for our 2012 Stallion Tanglewood’s Lightning. Lightning is currently available for purchase. Click on the Certificate for a larger view. Pedigree of Tuffer Than Leather. Tuffer Than Leather is out of Raggae Cowboy out of Sea Breeze by Mugwah X Breezy. Tuffer than Leather, the SIRE of Lizzy who is the DAM of Tanglewood’s Lightning.